Guide Map of Fuji, Hakone Area. 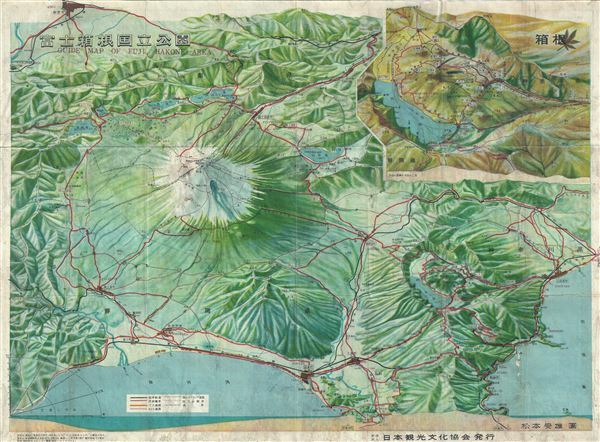 This is a beautiful 1952 or Showa 27 bi-lingual Japanese panoramic view of Mt. Fuji, Hakone, Japan. Issued by the Japan Tourism Association, it notes roads, railways and towns along with other important features. A large inset of the region in included in the top right quadrant of the map. Hakone (Hakone-machi) is a town in Ashigarashimo District in Kanagawa Prefecture, Japan. Hakone is located in the mountainous far west of the prefecture, on the eastern side of Hakone Pass. Most of the town is within the borders of the volcanically active Fuji-Hakone-Izu National Park, around Lake Ashi. Hakone is the location of a noted Shinto shrine, the Hakone Gongen, which is mentioned in Heian period literature. During the Gempei War, Minamoto no Yoritomo prayed at this shrine for victory over his enemies, after his defeat at the Battle of Ishibashiyama, which was also located with the borders of present-day Hakone. As with the rest of Sagami Province, the area came under the control of the late Ho-jo- clan of Odawara during the Sengoku period. After the start of the Edo period, Hakone-juku was a post station on the To-kaido- highway connecting Edo with Kyoto. It was also the site of a major barrier and official checkpoint on the route known as the Hakone Checkpoint (Hakone sekisho), which formed the border of the Kanto- region. Under the Tokugawa shogunate, all travelers entering and leaving Edo along the To-kaido- were stopped here by officials, and their travel permits and baggage was examined. After the start of the Meiji Restoration, Hakone became a part of the short-lived Ashigara Prefecture before becoming part of Ashigarashimo District in Kanagawa prefecture in August 1876. Hakone attained town status in 1889. After merger with five neighboring towns and villages in September 1956, it reached its present boundaries. This map was issued by the Japan Tourism Association. Text is in Japanese and English. Very good. Minor wear along original fold lines. Map exhibits stains throughout. Lower right quadrant exhibits minor damage. Professionally flattened and backed with archival tissue. Accompanied by original binder.